Our 6 frame nucs are on self spacing frames with 4 to 5 frames of brood at all stages (eggs, larvae & sealed brood), frames of food stores and a marked Queen, green for 2019. Our nucs are mostly headed with Buckfast however we may also have some nucs that are headed with Carniolan, Ligustica and Mellifera Mellifera queens that we could supply. See our queen pages for information regarding the specific races. Please note that if you do order a specific race we cannot guarantee to supply that race although we will do our best. All our bees are gentle and are suitable for beginners and the experienced beekeeper. Spring Nucs are normally ready towards middle / end May although this is weather dependent. We understand that most of you will be excited to receive your bees but we do ask for you to be patient as until the season fully kicks in it is very difficult for us to convey time scales. As soon as your nucleus of bees is ready I will get in touch to let you know. Your nuc will be ready, bursting at the seams and be ready to be transferred into a full size hive when it leaves us. To give you an idea of how the years differ last year, 2016 and 2015 saw our spring nucs go out in middle May, 2014 our spring nucs went out in early June, 2013 they were not ready until the end of July and in 2012 they were ready mid June. A deposit of £40 only is taken when placing the order. 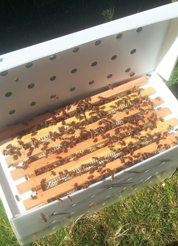 The polystyrene nuc hive has a built in feeder and an open mesh floor. It is easy to transport the bees in the poly box and it is a handy piece of kit to keep in your bee shed. It is made from high density polystyrene which is very strong and has great insulation properties, keeping the bees cooler in the summer and warmer in the winter.